All transactions are safe and secure with a reliable history in online purchasing behind each of our associates. Buy the Beavis and Butthead Shut Up t-shirt to own Beavis and Butthead clothing and merchandise. While they are not attending Highland High, the two work at Burger World manning the register and tackling burger flipping duties. 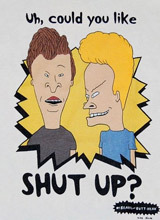 This Beavis and Butthead Shut Up t-shirt design features their reaction if you upset them at the register, "Uh, could you like Shut Up?" Treat yourself to some Beavis and Butthead action figures to reenact their days spent slacking at work and school. To embody the goofy characters, create Beavis and Butthead costumes from some of the tees in this gallery. In addition to the Beavis and Butthead Shut Up tee above, browse the Beavis and Butthead Clothing Gallery for more apparel like men's and women's clothes, kids shirts or hoodies.